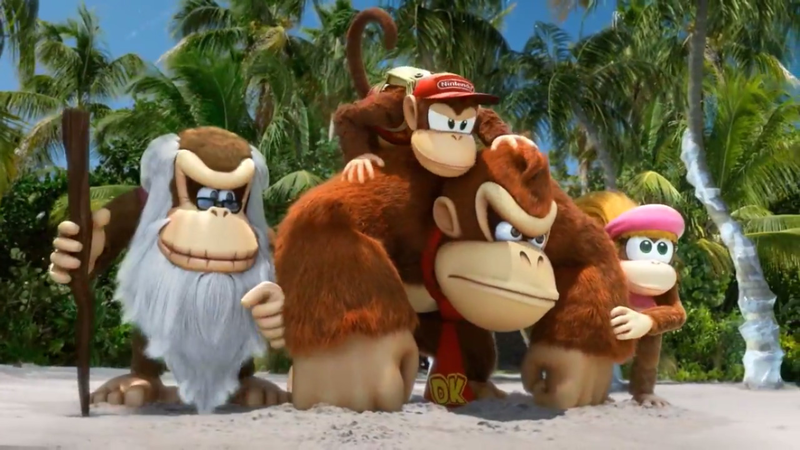 "Donkey Kong and friends got your back"
Nintendo of America, for a good while now, has opted to mix real-life actors with CG characters in its commercials, sometimes to excellent effect. A stand-out example was the North American advert for Pikmin 3, but now it's the turn of Donkey Kong and his companions to help out photogenic humans in need. 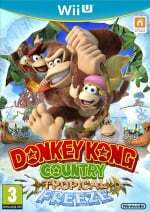 The new TV commercial below shows a father and son venturing towards the beach when they spot the rather menacing — or cute, depending on your point of view — Arctic enemies from Donkey Kong Country: Tropical Freeze. DK and the gang swoop into the beach to save the day, though we're glad it's all colourful computer-generated effects; this scenario would make for some nightmarish nature show footage. What channels are these commercials airing on? First thing that I think when I see an advert featuring anything other than game footage is if they need to do that it is because the game is not any good. Wii U has such an abundance of platformers which is great for me as they're my favorite genre. Yeah, they barely showed any game play footage. Most of which i've seen doesn't look too special anyways. There isn't that much excitement in modern nintendo commercials or any video game commercials these days. back in the 80's(Atari 2600, NES) and early early genesis and SNES days gaming commercials made you actually want to buy the game. they were in your face, exciting, loud and chalk full of personality and imagination. They were RAD and that's one of the things of the many that I miss about the golden age. After I'm done tackling Double Dragon II, i'm going to take on Donkey Kong Country Returns for the Wii. I still haven't played it yet, crazy i know. I was never huge over the original DKC back on the SNES, Yes It caught my attention with it's unique impressive prerendered visuals, but there was something about it that felt a little cheap, almost restricted with it's stripped down game play, compared to something like Super Mario World. Anyhoo, this is just another 'passive' nintendo commercial that won't Sell DK, it's not enough to get somebody hyped or leaping out of their chair. Great work Nintendo, focus on DK to the max, in fact show of adverts during the Winter Olympics starting this Thursday. This commercial ain't going to move units Nintendo. I'd rather have a commercial pulling at people's nostalgia strings by showing boys in the 1990's playing the orignal DKC and then showing them grown up playing DKCTF on Wii U. Air that on adult channels and BOOM you just sold some consoles. Despite my negativity, I'm still going to play the living crap outta this game. Can't wait! Am I seeing this right? A commercial for a Wii U game?? Sarcasm aside this game looks absolutely incredible and I can't wait!! @ianandian33 I know right? It's like when Nintendo actually advertises their games, they completely drop the ball. Hopefully they'll learn how to advertise eventually. Play it to death Nintendo! I think the commercial is great. It gives the story setup without saying anything, while showing gameplay. Plus, it's absolutely better than no commercial at all. Let's hope they air the hell out of it. Good commercial it just needs to show off the controls. This game looks beautiful, If I ever get a Wii U I'm picking this up no doubt about it. Can't wait for this game.Just recently beat dkcr on 3ds,and I'm ready for more.I will say this commercial was better than the Campbell's super Mario soup add.I don't think noodles shaped like nintendo's main mascot is going to change kids minds about wii u.Maybe if it was 1991 it might have had some impact. I don't think this is a bad commercial at all, Nintendo's main target audience is kids and teens, not 20 some year old guys. The add nicely focuses on the game itself, instead of showing a bunch of Wiimotes and gamepads (which just confuses people), and although it's a little cheesy, it's all in reason and not just plain embarrassing like some of the earlier Wii U adverts. Keep this kind of stuff up N, the 3D never sold the 3DS, it was the games, and that applies to the Wii U as well. Very cool. Feels very old school. Love it and can't wait for this game! I thought this commercial kicked donkey.Nintendo commercials are always my favorite. @sub12 It is unfortunate that the said target audience is not going to be swayed by this commercial.Nintendo may be aiming its focus at kids but these 20 yr old plus people are the ones supporting Nintendo currently.Im in my late 20's and I do not consider myself too old for Nintendo,and while I play tropical freeze little billy will be playing angry birds ios or halo or grandtheftauto 5 on 360.Im not trying to be negitive just looking at todays consumer trends that are very obvious at this point. Point well made, I know when I was 13 I was more excited to be fragging on Quake 3 vice playing Mario Party, etc.........I still think it was a solid commercial, better than some of the god awful early Wii U adverts. That's a good ad, and the game looks good too. @sub12 I spent some time with quake 3 back in the day.Good times! They look really awesome in a group like that. Pretty common with Nintendo adverts. Zelda Link Between Worlds ad showed a teenager with a sword in a dungeon, as if he was in the land of Hyrule himself. Mario & Luigi Dream Team ad showed Luigi in a coma in the hospital, with doctors playing the 3DS game. Has nothing to do with the quality of the game. It's just a way to get people's attention, and make the product appeal to them more. Well, it's about time, and this is a great game to advertise. Everyone loves Donkey Kong Country here in the States. Pretty good ad too. Counting the days until I get my hands on this! You know what would be perfect? An early eShop release. Let's have it already! Short and to the point but i quite like it. @TJGamer - Too bad Nintendo doesn't have a winter Olympics game to advertise during the winter Olympics. The video makes me want an open world 3D DK game. Of course I always prefer 3D over 2D but when DK first rolls those guys over on the beach it reminded me of my favorite game Jak and Daxter - and I'm still waiting for a proper sequel. As good as the graphics look compared to the Wii version it's still a bit glaring when that CG beach cut scene transitions into the game. I'm not expecting any game to look like real life - not even Far Cry - but I can just imagine non-Wii U owners seeing this great looking opening and then - "oh look, another 2D game that looks like a Wii game". This is not the game that's going to change the Wii U's fortunes. Hopefully they'll announce a few other release dates for Wii U games when this comes out to get people interested in the system. ACTUAL dates. the kind that let you pre-order games on Amazon. I know you can pre-order MK8, SSB and Bayonetta 2 on Amazon now but they all have Dec 31 as a date. not motivating. This will be one of the first games I get for the Wii U (after X and Super Mario 3D World). okay this is not the comercial i wanted to see but i knew they will make something like this and they are finally making comercials for there games oh my god okay for mario kart 8 and smash bros and the other wiiu games coming out this year show gameplay footage and finally get attention from consumers. but you know what i was going to get this game regardless . and at least they didit make a comercial having a family playing the game and smiling while they play it which is annoying and no one wants to see it and does not help the game. @WaveBoy Have you thought you might not be as excited by it because you have become jaded in your old age? In all seriousness, this is a decent commercial. It could be better. As long as they put in on television I'll be happy. They really should try to make their commercials appeal to more than just family gamers. LOL in my old age huh? Since when was 29(not 30 yet! )considered old? Maybe to the mind of a 12 year old. And yes, it's 'decent' but decent isn't going to cut it if they expect to dazzle the viewer and make them want the product. I just don't see it in this commercial. @WaveBoy Just busting some chops there friend I haven't been 12 in 9 years! I do agree it wouldn't make anyone want the game if they hadn't been paying attention to all the gameplay videos being released over the holiday season. Nintendo definitely should be making commercials for every 1st party title as if it was game of the year material. I don't understand why they don't since they are the only video game business with characters over 20 years old that are still relevant. That was pretty good, glad there wasn't kids. I'd imagine this is how Donkey Kong & his crew would look in-game on Nintendo's Next console...Then again, it will probably be their next console afer that. IF so, they'd be hitting a mute point as I can't see any of these characters going beyond the look of a character from a modern day pixar movie. at that point, Innovation will no doubt be the driving force. No you don't. Here take this instead. 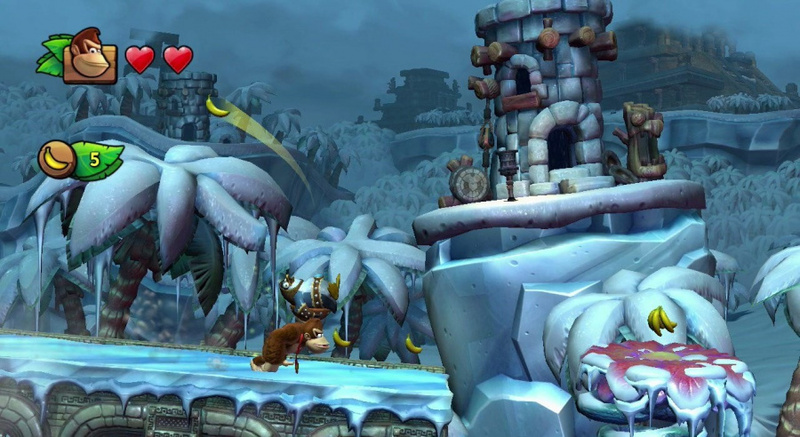 I would cry tears of happiness if an open world 3D Donkey Kong game came out. Donkey Kong 64 is one of my favorite games of all time so I would love to play something similar to it on the Wii U, or even the 3ds. I don't care what system. As for Jak and Daxter, I loved that game to death. My very first ps2 game. I still haven't played Jak 2 or 3 yet so I still need to play those. I just wish the Vita port wasn't such a mess. @SecondServing Just be glad you're not in charge of any major company. I can't wait to play this. Getting Bravely Default soon to though. Plus I just got back into MH3U. Plus I got about 40 games I got to beat... not even including my PS3 or wii/wii u vc. NEVER ENOUGH TIME! It's about time! Great commercial. Instead of advertising the console, each ad should focus on a single game. They should have had an ad for Super Mario 3D World - instead they lumped it in with an ad for the Wii U itself. @Excep7ional - "I still haven't played Jak 2 or 3 yet so I still need to play those. " No, trust me, you don't. I picked up the HD 3-pack at Target for about $10, played the first game over again, then boxed it up and put it on the shelf. I played them originally and it was tough going. Though if you play 2 and like it 3 is exactly the same but w/ car racing and chasing. I've always refereed to it as 2 1/2. Still do. I've never played DK64. Looks like the original Spyro game though, another classic 3D game. With voice acting and a shiny sidekick to boot. I really like the well timed DLC idea. I haven't played it yet - waiting for a sale to tie in w/ the Olympics to buy it - but some DLC - either a free new character or some costumes or something, or a paid new sporting event DLC - could help push the game. And it's a Wii U exclusive. And it has online multplayer. And for $50 you also get a Wiimote Plus, which costs about $40 making the game about $10. But I really haven't seen it advertised. I'll give Nintendo credit for having an in store kiosk demo though, one of the few games to get one. Porting that demo to home consoles on the update this Thursday I think would make a lot of sense, but it's been a good long while since we've had a home Wii U demo so I'm not holding my breath. 3DS seems to get 2 a month. Just saw this commercial on Cartoon Network. Not bad, but the Japanese commercial is longer and has much more gameplay!